Enna has created the 5S Shopfloor poster set to guide employees in creating organized and manageable work areas. All of the posters in this series describe and visually illustrate the referenced 5S activity. Use these colorful posters to brighten up work areas and motivate employees to practice the 5Sâ€™s everyday. 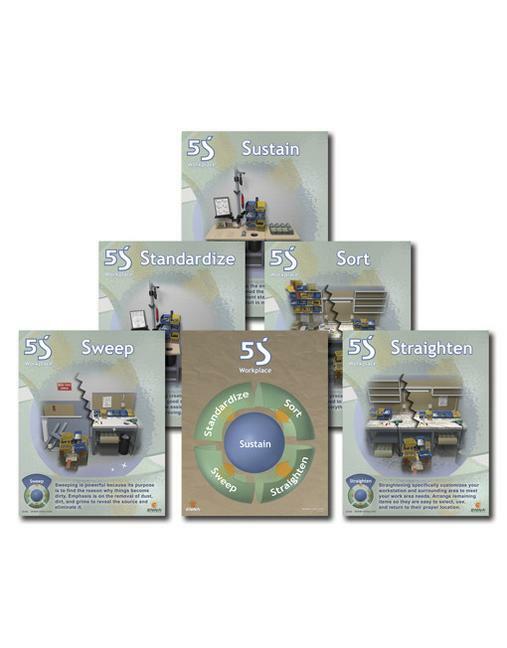 This set is a cost-effective and valuable way to sustain the results of a 5S implementation. As there are two industry-accepted English translations of the original Japanese 5Sâ€™s, we have created two versions of the Shopfloor 5S series posters. Version One contains the terms Sort, Straighten, Sweep, Standardize and Sustain.